All games are kinda created (at least in part) by programmers, so I always found it strange that there are so few games about programming itself. Too deep or too geek? Anyway even if attempts are few some of them get both programming concepts and gameplay really right. 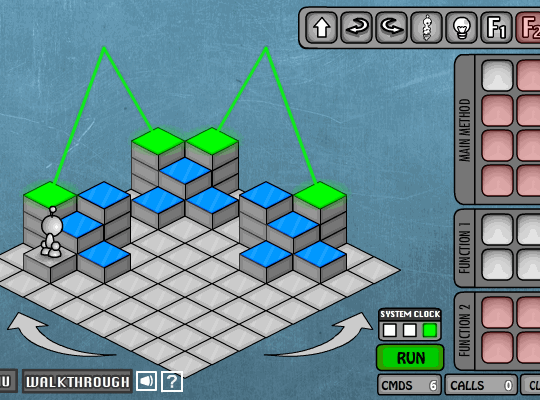 Light-Bot 2.0 is online puzzle game built on the principle of visual programming. Each level consist of tiles (starting with flat and in later levels enhanced with terrain and other special thingies) and bot – hero you get to control. Actual control is performed by building sequence of available actions. The goal is to reach and activate all blue tiles on level. It sounds almost like arcade/action game (control, run, get), but there is a twist – amount of actions you can perform is very limited and every move counts. Game is faithful to programming not only in program-remote-control basics, but in other gameplay principles and required logic as well. Only initial level can be solved with straight linear instructions. Latter levels require filling sub-sequences of reusable functions and making use of recursion to get through complex level with very few actions. As most flash games this one fails to save for me. Latter level are quite complex so I never really got through it from start to finish. Great game that is a real treat for people already acquainted with programming and easy introduction to algorithms for those who are not.